Those of you who will celebrating Thanksgiving in just a day, are you ready??? We have everyone coming to our place this year (I still won't be doing the cooking) and we are desperately trying to get our things in order... you know... to fool everyone into thinking we are tidier than we actually are. ;) It's a thing: FRANTIC SPEED CLEANING. Adorable! I've had that dress at the top of my wishlist for a while, but I just wouldn't get to wear a wool dress too often here in Cali! Happy Thanksgiving! No way Katie! Don't you dare eat my piece of pie! and with that warning I wish you a Happy Thanksgiving! I really like those shoes. Were keeping it mellow this year, which I appreciate. 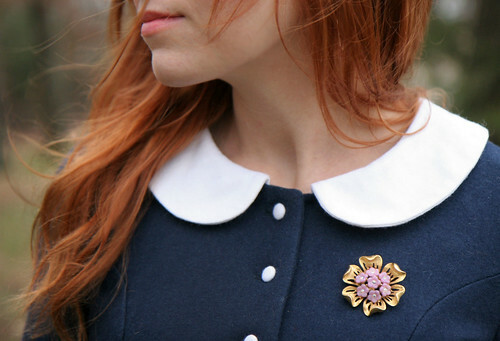 your dress is SO cute, i love the collar!! You are awesome. I love all of your clothes and you are now my number one fashion inspiration. Happy Thanksgiving to you! love the first picture, dress fits you perfect! Katie that dress is a dream on you! I love it so much! FRANTIC SPEED CLEANING! I can so relate to this. I love your twirl pic, so cute! That dress is so sweet! I love the whole look. This is one of my faves. It's so classically you! Katie believe me, your home can't be messier than mine. Because I'm moving tomorrow and everything is just standing in my way, really chaotic. oh, do i ever need this dress! so pretty! happy thanksgiving, mama! frantic cleaning is my best kind of cleaning...or my only. haha. I love that dress a lot. What?! I think I'm gonna cry...you're gonna eat my extra piece of pie. ;) Happy Thanksgiving! This outfit does look nice and warm! and those shoes...Love! So darn pretty, Katie! Happy Thanksgiving! No, I won't be celebrating anything basically because I live in Spain. I wish I was back in the States, I used to love Thxgiving, specially the pumpkin pie! Enjoy your day tomorrow! Love the outfit. The dress looks super cute on you. Love love love that dress!!! Love the outfit!!! canada already celebrated thanksgiving in october but happy thanksgiving anyway!!! i'm familiar with frantic speed cleaning. oh the surprise flowers in the shoes with the brooch. sweet peter pan collar & autumn golden tights! You = gorgeous. And YOUR SHOES. Your shoes. I love them. You are adorable and I'm coveting your dress! :) Have a happy Thanksgiving! I adore your blog, your style, and your little plush toys. Keep inspiring girl....from one artist to another :) Happy Thanksgiving. This is your CUTEST outfit to date!! I just love it!! I LOVE that dress! The shoes are beautiful, I was really thrilled with the rest of the brands shoes too. A pair will be going right at the top of my wish list. So adorable!!!! Love the colors and the boots are amazing!!!! I love your dress and the color of your tights ! I hope you can come on my blog and tell me your view of my last style ! 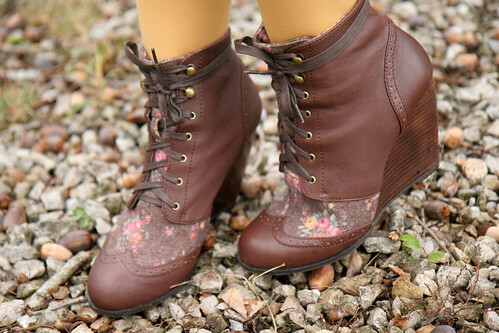 i cant even begin to describe how in love with those boots i am!!! are they comfy? ?